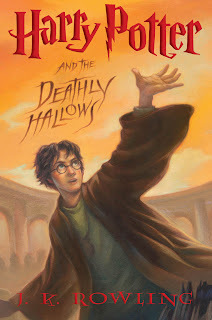 The first audiobooks I listened to are still my favorite - the Harry Potter series, by J.K. Rowling, read by Jim Dale. I've been waiting till the right time to post a review, and even now this is less of a review and more of a blog entry. Some of my favorite childhood memories are of when I was little and my older sister and I would lay in my parent's waterbed and my dad would read to us The Hobbit, by J.R.R. Tolkien. I loved his voices as he read the three trolls arguing over how to cook the dwarves, as Bilbo taunted the giant spiders that had captured his friends, while he busily dispatched them with Sting, his short sword, and as he risked enchantment by dragonspeech to find Smaug's weakness. It takes me back to childhood every time I read the book, and for this reason, it will always be my favorite single work of fiction. Well, now I have five sons, and it's my turn to carry the baton. As each successive son has reached the point where he can follow a complex story without pictures being read to him (usually around age 5) I've read the Harry Potter series to them and the next older brother has followed along for school credit. It's always so much fun for all of us. Tonight I finished reading book 7 to my now 6-year old son. As we read the part where Neville takes up Griffindor's sword, and then when Harry cast "expelliarmus" at Voldemort, my cute boy was so excited he stood up in bed and hooted and cheered. There's not much that I enjoy more than escaping into a good work of fiction, and it is one of those choice experiences of parenting to get to share that with my kids. Thanks, J.K. Rowling, for writing such an amazing series of wholesome, rich, enthralling, and engaging books to teach our children the joys of reading.